Yahoo! introduced a new Yahoo! Mail experience on Tuesday that purports to bring email back to the basics. The new Yahoo! 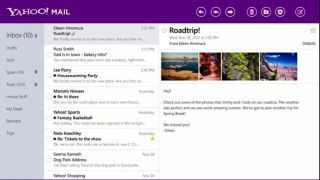 Mail includes a redesigned web client, a new Windows 8 desktop app, and mobile apps for iOS and Android, all of which are available starting today. "The underlying premise of email is pretty simple … yet, somewhere along the way, email got a little complex," Yahoo! Mail and Messenger General Manager Vivek Sharma wrote on the Yahoo! Mail blog on Tuesday morning. "Today, we're taking a step towards bringing email back to its roots," Sharma continued. The reimagined new Yahoo! Mail aims for three bullet points: to be fast, easy and available everywhere. The new Yahoo! Mail apps have reportedly been "built for speed," while the redesigned web client takes users directly to their inboxes and allows messages to be composed and read more quickly. Improved search functions help as well. Overall, Sharma wrote on the Yahoo! Mail blog, the changes will save Yahoo! Mail users an average of 36 million minutes every day. To make the Yahoo! Mail experience easier, Sharma explained, every aspect of the web client has been simplified so users will only see the options that they need. On the apps side, each version (iOS, Android and Windows 8) reportedly takes advantage of its respective platform's unique functions to make things easier on users. Yahoo! CEO Marissa Mayer emphasized the improvements to the Yahoo! Mail experience in a separate post on the Yahoo! corporate blog. "We've redesigned the new version of Yahoo! Mail with speed in mind," Mayer wrote on Tuesday morning. "Getting through your emails is faster than ever before. "We've also made your inbox more intuitive and easier to navigate, allowing you to focus on what matters most: your messages. And, because mobile is everything these days, Yahoo! Mail now has a consistent look and feel across devices." Mayer wrote that the new Yahoo! Mail web client should roll out to users "over the next few days," while the Windows 8, iOS and Android apps are available now. Earlier this year, VentureBeat reported that Gmail had pulled ahead in the email wars, with 425 million monthly active users. That number came straight from Google, while Yahoo! user numbers could only be estimated using third-party data from comScore. But those numbers had Yahoo! at less than 300 million monthly users (and Hotmail at 325 million). When reached, a Yahoo! spokesperson did not have any monthly numbers to share, but did divulge that Yahoo! Mail has 105+ million distinct users every day. In addition, according to the spokesperson, users spend a total of over 35 million hours using Yahoo! Mail every day, sending 30 billion emails with 600 million photos and 200 million attachments.